Feeling Depressed? Maybe It’s Because of Your Job! A personal care provider is twice as likely to develop depression than a software programmer, according to the latest National Survey on Drug Use and Health (NSDUH) report released last week by the Office of Applied Studies. The study focused on the relationship between depression and occupation among adults (age 18 or older) who work full-time. Data from 2002 to 2004 was used in the study, which found that overall nearly 7% of all full-time workers experienced major depressive episode (MDE) in 2006. The report ranked Personal Care and Service as the occupational category with the highest rate of depression, at nearly 11%, followed by Food Preparation and Service at a little over 10%. The study also found that females are in general more likely to feel depressed than their male counterparts across all job categories. 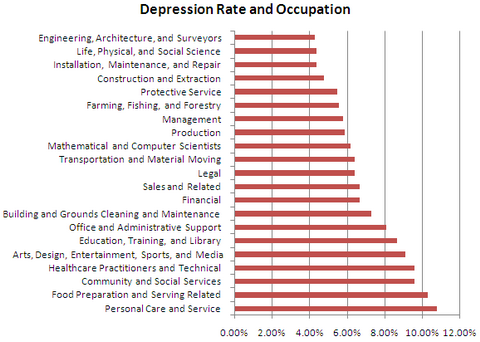 Which job has the lowest depression rate? The answer is in the following chart. How Concerned Are You About Net Worth? Depression is caused primarily by genetics, physiological factors, and life experiences. Occupation is rarely if ever a factor. If you’re depressed, please seek help to address the root causes. Changing jobs could likely make the situation worse. Hmmm…. I don’t see “desk monkey” or “cubicle farmer” listed. I guess people in my line of work don’t get depressed! Oooh, unless Office and Administrative Support counts, then it looks like I’m in trouble. Ah yes, luckily my job is somewhere in the middle. Not enough depression to make me sad, but just enough to keep me on my toes. I wish they had another chart with “titles” to see what people did and their depresssion rates. I was amongst the 6.5% of programmers who was depressed with his job. American Express, I am Disappointed! 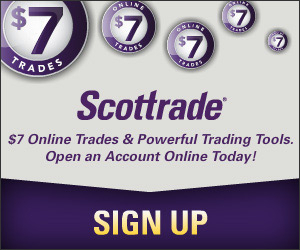 Are You a Rate Chaser?